With Readly you can read Titanic - A Human Tragedy and thousands of other magazines on your tablet and smartphone. Get access to all with just one subscription. New releases and back issues – all included. A century after it sank to the bottom of the Atlantic Ocean, the Titanic remains the most famous ship in the world. Our special commemorative magazine tells the whole dramatic story of the disaster and the aftermath. 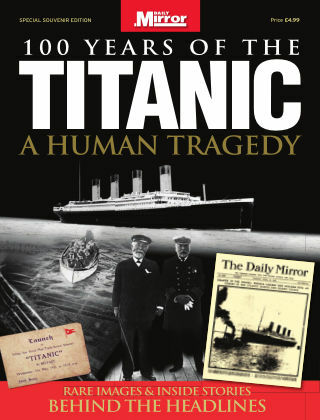 This glossy 84-page publication features rare and unseen images from the magnificent Daily Mirror archive, plus Mirror pages and reports from the time, as we recall how the ship believed to be unsinkable met with catastrophe. The human stories of those who were saved and lost are highlighted, as well as the controversy over why it sank and who was to blame. We also assess how the Titanic has continued to hold a fascination on the public, particularly through the long search for the wreck and its hidden treasures.